The 2014 V-Strom 1000 is the second generation of a rather successful adventure motorcycle that Suzuki debuted in 2002. Back then the bike was good for its time but its rivals from BMW and KTM have moved the game ahead significantly. For 2014, the new V-Strom offers the same blend of good on-road dynamics and acceptable off-road ability but in a new package that's significantly improved. 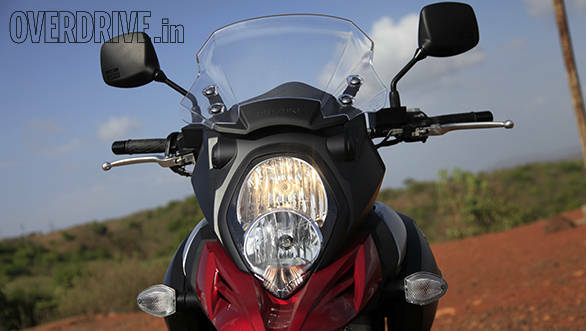 The motorcycle has gone on sale in India at Rs 14.95 lakh ex-Pune. 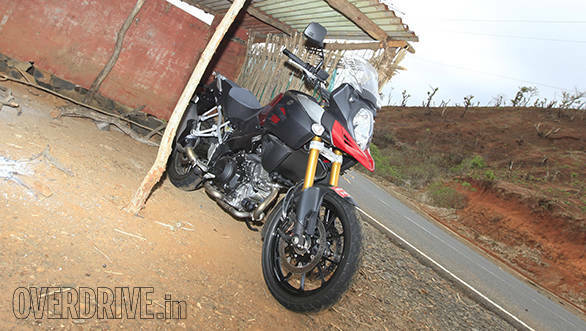 We rode it to see what the bike feels like - it certainly held out the promise of being amongst the top all-round adventure touring bikes in India when it was unveiled at the Auto Expo. Is 101PS enough? Don't litre-class engines make nearly double that these days? Yes they do. But you're thinking of sportsbikes. There's no point in making a do-it-all motorcycle with an engine that perpetually feels like it's high on caffeine. Sportsbike engines are extremely highly stressed to produce huge power at stratospherically high revs. That is what that format of motorcycling requires. The V Strom - and by extension adventure touring motorcycling - is completely the opposite. This bike is all about relaxed, unstressed performance that's characterised by gobs of low end torque. It doesn't have to blow your socks off, it has to take you and your socks any distance you like at the drop of a hat while crossing almost any terrain that you come across. The 1037cc V-twin displaces 41cc more than before and as a result max torque is now produced much lower in the rev range. There's 103Nm of it that peaks at a super low 4000rpm. 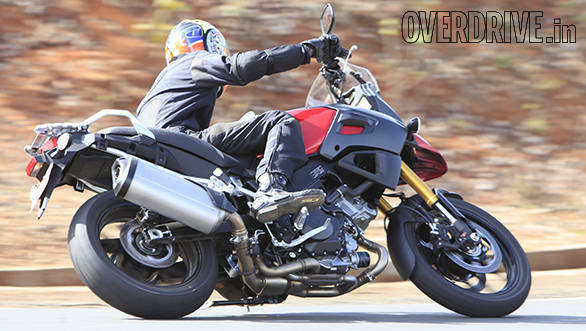 All this means that V-Strom provides a delicious slug of torque from as low as 2500rpm. The engine is smooth and revs to 9500rpm but we found that you never have to cross about 7500rpm after which it starts to feel a bit flat. And don't think of it as slow. It may not make 200PS, but it will do 180kmph without effort anytime you feel like. Looks tall. What happens when you come to a stop at a traffic light? Tall bikes are difficult for short people in general but our experience says that this is more a mental issue than a real one and you can teach yourself to live with a bike that's bit too tall for you if you really want to. Looks tall. How does it corner? 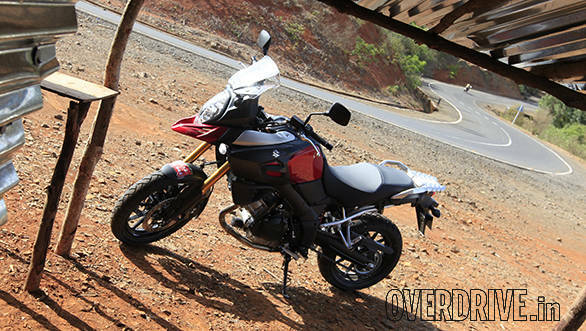 The V-Strom comes with a large 19-inch front wheel thanks to its off-road identity. This isn't going to give it razor sharp willingness to drop into a corner. But again, it doesn't have to - it's not a sportsbike. Like the engine, the handling needs to be stable and secure rather than hyperactive. Suzuki has a totally redesigned chassis for the 2014 model that includes revised geometry and an improved riding position. It runs 110/80 section tyre up front and a 150/70 section tyre at the rear. That isn't very wide but the Bridgestone Battle Wing tyres provide good grip and confidence without any drama. The bike takes a little muscle to get into a corner but once leaned over it feels stable and drama free. It's a surprisingly fun motorcycle in the twisties and you'll be scraping the cautiously low set foot pegs in no time. The bike also gets traction control to smooth out any issues but we were surprised to note that our hamfisted cornering simply couldn't cause enough of a crisis to trigger the safety nets. Can I go off road with this thing or not? 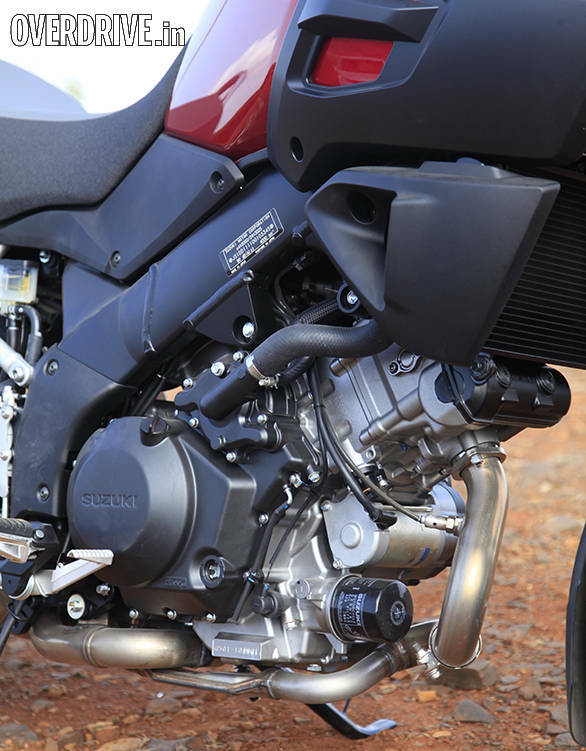 The V-Strom comes with pretty high spec 43mm fully adjustable KYB upside down forks. The rear features a monoshock that is remotely preload adjustable. The Strom has some of the best ride quality I have ever experienced on a big bike (mind you I haven't ridden a Triumph Tiger 800/Explorer or a BMW R1200GS). The bike simply ploughs through rough and scarred roads at speed without a complaint. Encounter a pothole or speed breaker and you can simply stand on the footpegs and steamroll through. But we didn't take the bike too far off the road but the adventure-ready tyres and decent ground clearance means it should handle quite a bit. 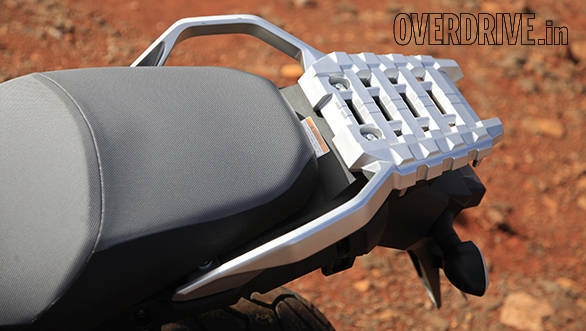 But the lack of a proper bash guard and switch off-able ABS means it may not be the last word in ultimate dirt-ability. The three-step traction control definitely helps though, and you can switch it off if you like. But this will be an excellent bike to ride to a place like Ladakh. You'll enjoy the ride getting there and the big Suzuki will handle the hostile environment with ease. I'm crazy enough to ride it to work every day. Can the V-Strom 1000 handle it? And more importantly can I handle the Strom? Both of you should be able to handle it with ease actually. The bike is grumble free at low revs and the high riding position gives you a nice vantage point. The sheer size of it means you might not be able to filter like you would on a much smaller KTM but it is still a quick and easy bike to ride. The unstressed nature of the engine also means it runs very cool. We spent half an hour in thick Pune traffic and the temperature gauge never crossed the half mark and ran pleasantly cool. Did we mention that the V-Strom 1000 also seems to get great gas mileage? We didn't test it but our heavy-handed first ride indicated 17kmpl of average consumption on the meter. So 22-25kmpl on the highway and 17-19kmpl in the city should be possible. Will my friends think it's cool? If your friends recognize what it is and what it can do they certainly will. But if they belong to the 'faired' brigade then they probably won't. It may be an imposing machine to look at, but it's not a particularly pretty one. If we're on a highway ride together will I be able to keep up with the crotch rocket fans? Make no mistake, this is a very fast bike. 0-100kmph should take just about 3 seconds and the top speed will be north of 200kmph. It will hit 180kmph without much of a thought. The Strom doesn't have the monstrous top end whack of a big sports bike but it should be able to keep up with them in the real world with ease. And that's where the confusion sets in. At Rs 17.1 lakh on road Pune this is not a cheap motorcycle. There are plenty of tempting and ballistic motorcycles available at the same ball park figure. But almost none of them can offer the same unstressed, practical and real world performance a V-Strom does, especially in our riding environment. Look at it like this. Could you ride a Busa to Leh? You probably could with some trouble. But would you? The thing about the V-Strom is that you could, you should and chances are you would. 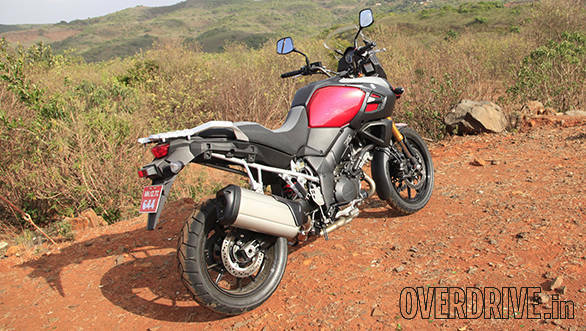 Is this the best adventure motorcycle on sale in India today? The prospective Indian adventure bike buyer is more spoiled for choice today than ever before. He can choose from the premium but frightfully expensive BMW GS range that costs about Rs 32 lakh on road in Mumbai. Significantly lower down the price ladder is Triumph's Tiger XC Explorer that costs about Rs 20.2 lakh on road Pune. 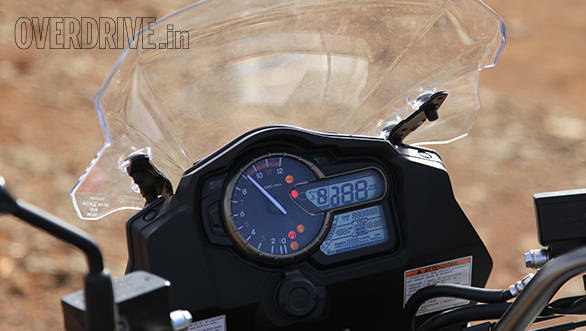 The most affordable of the lot is the Triumph Tiger 800 XC that will set you back by Rs 13.6 lakhs on-road in Pune. The BMW is a legendary motorcycle that may well be more accomplished than the Suzuki. But is it fair to say that the V-Strom is half the motorcycle the BMW is because it costs about half as much? No, we don't think so either. That leaves the two Triumphs. Now that makes for a more interesting question. The Triumphs are both internationally acclaimed motorcycles that are towards the top of the adventure bike game. We're as eager to know as you are. Look out for a proper comparison coming up soon. 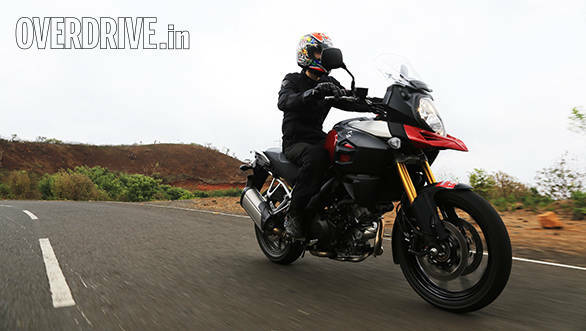 Meanwhile, the V-Strom 1000 is a surprisingly convincing motorcycle for Indian riders looking for something that has the wherewithall to deal with our unpredicatble conditions.